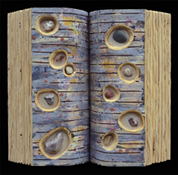 Earth Texts is a series of wooden relief sculptures (carved, burned and painted with encaustic) that create visual metaphors of the book form as well as autobiographical explorations. Playing off concepts liketouchstones, table of contents, and abridged, these pieces operate in one sense as visual puns and connect ideas of language to both earth and body. 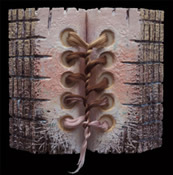 In Deetz’ works, the interplay of forms in each piece seeks to explore what we know or how we behave. Books embody text, and the “text’ connects internal and external landscapes in a search for answers to human dilemmas. The plywood from which they are carved represents nature destroyed; construction of the art piece from the plywood represents nature re-empowered or its pattern again disclosed. The tactile paint surfaces, created through layers of encaustic (wax and pigment), serves as “skin,” unveiling greater complexity beneath. Like books, these pieces request a reading, and the layers of text allow for layers of interpretation. Deetz is a faculty member of the University of Wisconsin-Green Bay.